What does geology have to do with natural communities ? More than you might think. The types of bedrock and/or sediments in a place largely determine the shape of the land and the make-up of the soil , both of which influence what types of plants can thrive there. Rapids—where Rock Creek drops perceptibly in elevation. Photographer: Gary FlemingRock Creek Park is in the Fall Zone—the boundary between the Piedmont to the west and the Coastal Plain to the east. Map tip: To get a general idea of where Piedmont and Coastal Plain meet, go to the interactive map of Rock Creek Park and zoom out until you can see the whole park. In Layers On/Off, switch the main data layer to Ecoregions. It’s called the Fall Zone because waterfalls and rapids are common on streams as they fall from the resistant rocks of the Piedmont onto the low-lying Coastal Plain. The Fall Zone extends along the eastern seaboard from New York to Georgia. The hilly Piedmont province is made up of solid, resistant rock that formed miles beneath the earth’s surface under intense heat and pressure. At that time, the Piedmont and the low mountains to the west were covered by an ancient mountain range perhaps as tall as the Himalayas. Erosion removed untold masses of rock and transformed this soaring range into low rounded mountains. At Rock Creek Park, most natural communities are underlain by Piedmont bedrock, which weathers into a fine mineral soil . (See Soils at Rock Creek Park.) In these communities, you may come across rock outcrops or angular boulders on the forest floor. 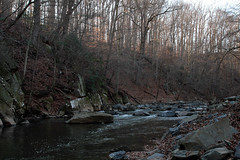 The few natural communities in Rock Creek Park that are underlain by the Coastal Plain grow in sediments such as cobbles, gravel, sand, and clay . 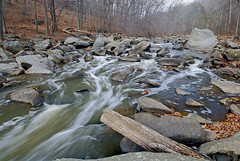 The Fall Zone in Rock Creek Park contains many rapids, where water tumbles over rocks as it runs to lower ground. Look for impressive rapids in Rock Creek from south of Military Road down to Boulder Bridge. You can also see marked elevation drops—evidence of the Fall Zone—in most of the tributary streams in the park, typically in the sections just above where they flow into Rock Creek. Map tip: To find these locations, go to the interactive map of Rock Creek Park and search for "rapids," "military road," or "boulder bridge." Steep banks and rapids where Rock Creek has cut down through rock. Photographer: Sam Sheline, courtesy of NatureServeThe Piedmont is made of hard metamorphic and igneous rock . Ecobit: How Metamorphic and Igneous Rocks Were Formed Over time, Rock Creek has eroded this hard rock into a deep gorge, giving the region the steeply dissected landscape that is a dominant physical feature in the park. 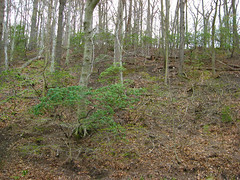 Oak - Beech / Heath Forest growing over outcrops of Laurel Formation . Geologists think that the metamorphic bedrock that underlies Rock Creek Park probably originated in a volcanic arc out in the ancestral Atlantic Ocean. The rock was originally a mix of muddy sand and quartz that accumulated on or near the volcanic arc. There were also inclusions of volcanic ash and rock in the muddy mix. Imagine fiery clouds of ash and rock fragments blown out of a volcano rushing over the landscape at hurricane speeds, picking up other rocks, and resulting in a kind of deposit in which fragments of various rocks are scattered at all angles throughout the sedimentary matrix. This sedimentary rock was transformed—metamorphosed—by tremendous heat and pressure during the continental collision into the hard metamorphic rock we see today. Geologists sometimes use the name " metasedimentary rock " for the kind of metamorphic rock in the region of Rock Creek. It's just a way to say something about the origin of the metamorphic rock—it's metamorphosed sedimentary rock. But remember those inclusions of ash and volcanic rock? Some of these embedded fragments are quite large—up to tens of feet long. Their chemical makeup is often more basic than the surrounding rock. Because of this, they can contribute plant nutrients to the soil, creating pockets of fertility in the middle of otherwise nutrient-poor soils. If these embedded fragments of basic pH ash and rocks occur on slopes, their enriching influence may even reach plant communities downslope due to the effects of groundwater , erosion, and gravity. There are two named units of this metamorphic ( metasedimentary ) rock in Rock Creek Park: the Laurel Formation and the Sykesville Formation . These two units look similar, but can be distinguished by geologists because of the different compositions of the embedded fragments. The Laurel Formation underlies most of the main unit of the park. You can see the Laurel Formation exposed in the Valley Trail Quarry, at Pulpit Rock on Valley Trail, and as an outcrop on Cross Trail 2. Map tip: To find these locations, go to the interactive map of Rock Creek Park and search for "Laurel Formation." The Sykesville Formation occurs in the western and southern reaches of the park system, mostly at Palisades and Battery Kemble Parks and along sections of the Rock Creek & Potomac Parkway, but also in pockets along Melvin Hazen Branch and elsewhere. At Palisades Park, particularly base-rich inclusions in the Sykesville Formation may help explain the presence of a lush Basic Mesic Hardwood Forest. Map tip: Search for these locations on the interactive map of Rock Creek Park. In general, however, both the Laurel and Sykesville Formations have weathered into loamy soils of poor fertility, especially on the higher uplands , and generally support the Mesic Mixed Hardwood Forest and the Oak – Beech / Heath Forest. The second main type of bedrock found at Rock Creek Park is igneous rock, which is rock that solidified from magma . 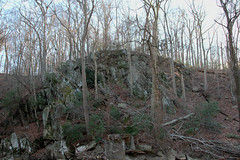 These kinds of intrusive igneous bedrock underlie large sections of the southern and western parts of Rock Creek Park. They vary in chemistry, but generally are less acidic than the local metamorphic rock; they contain calcium, magnesium, and other base elements, which are favorable to plant growth. The most common igneous rocks in the park are tonalites, coarse-grained rocks that typically have a basic to semi-basic chemistry. Tonalites can be dark or light in color, depending on the specific minerals and inclusions they contain. The large intrusive body of Kensington Tonalite lying west of Rock Creek is a light-colored bedrock that resembles granite in both its appearance and its slightly acidic chemistry. Ecobit: “Rock Creek Granite”—the Rock that Built Northwest Washington, D.C. The Kensington Tonalite weathers into deep, sandy and loamy soils. On hillsides, these coarse acidic soils tend to lose water rapidly, and thus support drier forests on uplands as compared to soils derived from most other igneous rocks. In Rock Creek Park, the natural community most commonly found on Kensington Tonalite is the Mesic Mixed Hardwood Forest. Good exposures (or rock outcrops) of this bedrock, its well-drained soil, and the types of communities that grow on it, are found on most of Rock Creek’s western tributaries , notably sections of Broad Branch (and along Grant Road), Soapstone Valley, and Melvin Hazen Valley. Igneous rocks with a more basic pH are present in small areas of the park, mostly west of Rock Creek, or south of Peirce Mill. The most strongly basic rocks in the park, called mafic rocks, contain abundant iron- and magnesium-bearing minerals and are heavy, dark, and resistant to weathering . Dark-colored hornblende tonalite with inclusions of mafic rock . Photographer: Tony FlemingWhere mafic rock lies relatively close to the surface, the soil overlying it is moderately fertile. The rock’s proximity to the surface provides a small but steady supply of base elements, especially calcium, which enhances plants’ ability to take up many other nutrients. Many of the soils weathered from basic igneous rocks also possess other properties that favor vigorous plant growth. Their relatively fine texture—silt loam to clay loam—holds moisture and is conducive to extensive, deep root growth. Some contain abundant soil vermiculite weathered from minerals that are high in magnesium and iron (such as biotite and hornblende, found in mafic rocks). Vermiculite is the same clay-like mineral found in some high-quality potting mixes, and it effectively holds calcium and other nutrients in the root zone (ready for plants to take up), and keeps the soil from getting compacted. The moisture- and nutrient-dependent Basic Mesic Hardwood Forest or a moderately lush variant of the Mesic Mixed Hardwood Forest are commonly found on soils weathered from basic igneous rocks. Both natural communities, but especially the Basic Mesic Hardwood Forest, are characterized by a wider variety of plants (especially spring wildflowers) than other communities of Rock Creek’s uplands. Examples of both natural communities are best seen in mid to late spring along several of Rock Creek’s western tributaries—such as those that run through Montrose Park, Normanstone Parkway, and Melvin Hazen Valley—as well as at Glover Archbold Park. Throughout the park, you will occasionally come across milky white veins or seams of the mineral quartz cutting through other rock types. These quartz veins were once liquid silica, with some other elements, in a hot-water slurry that filled in cracks in solid rock. Over time, the hot slurry cooled into solid quartz. 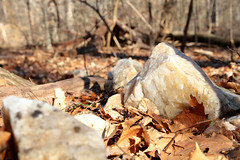 Loose quartz rock on forest floor. Photographer: Sam Sheline, courtesy of NatureServeQuartz is a very hard mineral, and slower to erode than surrounding bedrock in Rock Creek Park. 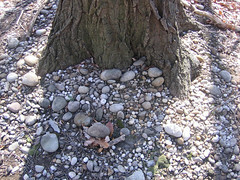 Look for angular white stones of varying sizes, either protruding from the ground in somewhat of a line, or lying loose. In some areas, prospectors searched for gold in quartz veins running through rock. A few old trenches here and there still testify to this bit of history. Most quartz veins are too small to significantly influence soils and plant communities. Larger veins slowly break down to form coarse and acidic soils, creating infertile conditions where you can expect to find acid -loving plants such as chestnut oaks and mountain laurel in communities like the Oak – Beech / Heath Forest and the Chestnut Oak / Mountain Laurel Forest. Most of the bedrock mapped in the park 3 4 has been broken into blocks bounded by faults. Ecobit: For Fault-Finders in Washington The fault blocks range greatly in size, from a few square feet to several square miles, and some have been transported great distances by motion along the fault. Mountain laurel (Kalmia latifolia) on a steep acidic slope east of Peirce Mill. Photographer: Judy Teague, courtesy of NatureServeBecause of motion along the faults, blocks of bedrock with very different chemical and soil-forming properties sometimes occur side by side. A large fault separates the acidic Laurel Formation to the east from more diverse blocks of rock to the west.5 The natural communities east of the fault are largely tolerant of acidic conditions of the Laurel Formation. To the west of the fault, natural communities range from acid-tolerant to those dependent on base-enriched soils. 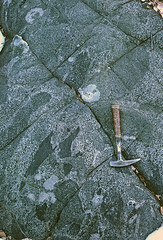 An example of this can be found in the vicinity of Peirce Mill, where fault motion has placed the acidic metamorphic bedrock of the Laurel Formation next to more basic igneous bedrock. Before the trees have leafed out, look east from Peirce Mill across Rock Creek and Beach Drive to the steep, west-facing slopes just beyond. There you can see evergreen , acid-loving mountain laurel dotting the hillside—part of the acid-tolerant Oak – Beech / Heath Forest growing over acidic bedrock. 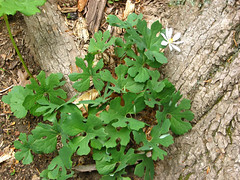 Bloodroot (Sanguinaria canadensis) blooming in early spring. Photographer: Erin Lunsford Jones, courtesy of NatureServeBehind you in Melvin Hazen valley, you can find the Basic Mesic Hardwood Forest, with patches of mayapple and other wildflowers in spring, growing atop mixed igneous rocks with a more basic chemistry. Map tip: To find this location, go to the interactive map of Rock Creek Park and search for "peirce mill." Ancient river terrace gravel, exposed by frost action at the roots of large trees on a hilltop. Photographer: Rod SimmonsSurficial geology refers to sediments that are unconsolidated, that is, not part of a solid sedimentary rock. Ancient river gravels , found on some ridgetops in the park, are the most extensive type of unconsolidated deposit in the park. They consist of well-rounded, water-polished stones and sand that were likely deposited by a pre-historic river. Ecobit: Ridgetop River Terrace Riddle Prolonged weathering has produced an acidic, stony soil that is less hospitable to most plants than the finer-grained soils derived from Piedmont bedrock. On the dry, acidic upland sites where the gravel layer is thick and covers a sizable area, you will find some of the most striking natural communities in the park—the Chestnut Oak / Mountain Laurel Forest, and the Mixed Oak / Heath Forest. At the base of some of the large trees growing on these terraces, look for rounded cobbles exposed by erosion caused by rainwater running down the trees. On many hills at Rock Creek, these sediments have been pulled downhill by gravity and erosion to form colluvial fans—aprons of loose sand, rounded pebbles, and cobbles. In places, this colluvium is sufficiently thick to have a major impact on the soil profile and the type of plants growing on it. An example can be seen along the trail in the upper part of Melvin Hazen Valley. There, a prominent colluvial fan of acidic gravel supports a few old-age acid-loving chestnut oaks (some now fallen). Surrounding the fan is a very different natural community—the Basic Mesic Hardwood Forest, which is on basic igneous rock. Map tip: On the interactive map of Rock Creek Park, find the trail that passes this site by searching for "melvin hazen trail." Unconsolidated Coastal Plain sediments underlie the natural communities in a small percentage of the park. The Coastal Plain sediments in the park are composed of various proportions of cobbles, gravel, sand, silt , and clay. They have never been buried sufficiently deep to be compressed and consolidated into bedrock. The sediments were deposited long ago by rivers flowing out of an ancient mountain range that covered today’s Piedmont. As sea level rose and fell, the coastline where the rivers dropped their sediment moved back and forth along the landscape. Because of its location along the Fall Zone, Rock Creek Park provides a good opportunity to visualize how the boundary between the Piedmont and Coastal Plain has moved back and forth over the millennia. In the distant past, much of the park was covered by Coastal Plain deposits, but today they are present in fairly continuous layers only at eastern park units such as Fort Totten. In other areas of the park, they were mostly removed by erosion and are visible today only as isolated remnants such as on the ridge where the Nature Center is located, and along the summit of the Wisconsin Avenue Ridge, where they are well-exemplified at Fort Reno. Map tip: To find these locations, go to the interactive map of Rock Creek Park and search for "fort totten," "fort reno," or "nature center." 1. Fleming T, Drake Jr. AA, McCartan L. 1994. Geologic map of the Washington West Quadrangle, District of Columbia, Montgomery and Prince Georges Counties, Maryland, and Arlington and Fairfax Counties, Virginia, GQ-1748. Scale 1:24,000. 3. Fleming T, Drake Jr. AA, McCartan L. 1994. Geologic map of the Washington West Quadrangle, District of Columbia, Montgomery and Prince Georges Counties, Maryland, and Arlington and Fairfax Counties, Virginia, GQ-1748. Scale 1:24,000. 4. Southworth S, Denenny D. 2006. Geologic map of the National Parks in the National Capital Region, Washington, D.C., Virginia, Maryland, and West Virginia. Geological Survey Open-File Report 2005-1331, available only online.